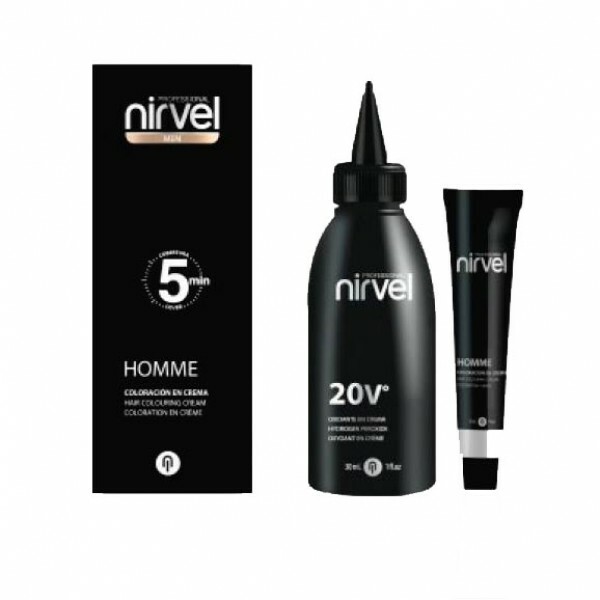 Homme Hair Colouring Cream from Nirvel Professional covers grey hair quickly and easily in just 5 minutes. Homme from Nirvel Professional is specifically designed for the urban man who wants to subtly restore his natural hair colour. The smooth and conditioning texture protects the hair fibre and scalp. Arginine helps to reduce application time as it can make you look younger in just 5 or 10 minutes. Homme does not contain ammonia or p-phenylenediamine. Macadamia oil will keep your hair nourished and looking healthy. Does not contain ammonia which is the main cause of skin irritation and unpleasant smells found in traditional hair colours. Does not contain p-phenylenediamine, one of the colourants that causes most skin sensitivity problems. Smooth and easy to apply, whether at home or at the salon. Quick and easy: in just 5 minutes you’ll achieve a light and subtle colour. Pigments which provide an intense yet natural colour. By leaving on for 5 minutes, you’ll achieve a light and subtle colour. By leaving on for 10 minutes, you’ll achieve a more intense colour. Pour the tube contents into the bottle of oxygenated water and shake. Apply the colour by combing it through the hair. Leave on for 5 or 10 minutes. Rinse hair with plenty of water and dry. Important: Do not leave on any longer than recommended.